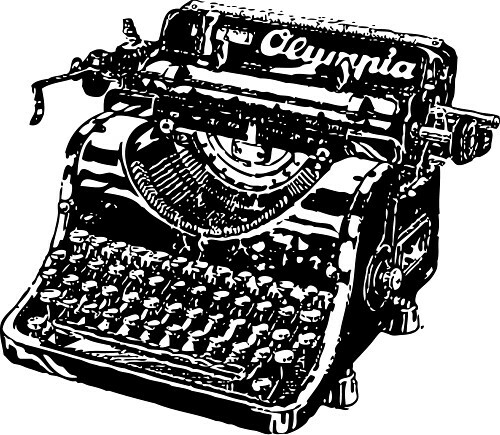 Starting in my college days, I wrote on an old-fashioned typewriter like this one. I still have it. I was slow to take to the computer but will never return to typewriters. Note from Phil: A woman from Kansas named Bonnie recently stumbled upon this combination website/blog and asked for some advice on becoming a published writer. Now I’m not the best person in the world from which to seek writing advice. I haven’t written the great American novel. Heck I haven’t even written the not-so-great American novel. But I’m not one to turn down a request for help, and I do have writing experience. I worked full-time as a reporter and editor for years. And I continue to make a decent part-time income as a reporter, editor, columnist, freelance writer and publicist. Plus I once self-published a non-fiction paperback, and I provided the written content for a book documenting the history of a business. So following are Bonnie’s request for help in italics, my response, sent to her via e-mail a day or two later, and her note of thanks, also in italics. …I feel called to write..and have a ball and chain (fear/anxiety) around my leg holding me back. A friend recently got 13 of her stories published, and when I asked for guidance she said that “As a mother of 9, I don’t have the time.” She guided me to the AWAI site and I explored it. I have so much to say but don’t know how to begin. My fascination with words, spelling and a compulsion to say “just what I mean” I feel gives me a jump start. Without education in journalism, nor any passion to read all that much, except Christian content, all I have to qualify me is an opinion. Do you have any suggestions on how to begin? I will value all nuggets of wisdom. I enjoyed your site. You are having a rich life. Go for it! I started writing — and getting published — long before I had any formal journalism training. So it can be done! My first published articles dealt with stock car racing, an area where I have an interest and knowledge. They were driver profiles and ended up in what then was called NASCAR Newsletter. Inspired, I bought a book that offered advice on writing magazine articles and getting them published. I followed the instructions in the book, and it worked. I had a couple of articles on racing safety published in Stock Car Racing magazine. Then, wanting to branch out, I submitted an article on the merits of slowing down and enjoying life to Country magazine. They bought it and put it on the back cover. As I recall, it later was listed by readers as one of Country’s best-loved articles of the year. I’ve found that once you have some published articles — they’re called clips — you’re taken a bit more seriously by other editors who are considering your articles for publication. How do you become a writer worthy of publication so you can get those clips? — First, writing, if done properly, is hard work. Don’t let anyone tell you otherwise. You need to know that from the outset. — Think like a writer. When you see or hear something that triggers an idea any time of the day or night, jot it into a pocket notebook for later development. Many writers keep full-fledged journals. — Look at everything in life — from the joy of watching your child graduate from high school to that time the car broke down at the worst possible moment — as, potentially, your next story. These writing tips, for example, will likely end up on my blog. And someday maybe I’ll develop them into an article I can sell. — We all have areas of special interest, and it’s fine to write about them. But cover other topics as well. A good writer can, with the proper research, write about most anything. — Make time to read, whether it’s newspapers, magazines or books. (Preferrably all of the above.) If money is an issue, some of this stuff is available free on the Internet or at the library. But I can’t stress this enough: A good writer is a good reader. — When reading, take note of the various ways writers express themselves. Examine their sentence structure, grammar and how they handle quotes in non-fiction and dialog in fiction. Study their styles and techniques. Determine what you like and why. Also determine what you don’t like and why. — Write something each day, even if you can only spare 15 or 30 minutes for it. — Rewrite your essays or articles over and over until they’re the best they can be. This is part of the “hard work” of writing. There are countless ways to express the same idea. Find the most succinct, interesting, conversational way of doing so. You want to hook your reader, then keep him or her throughout your story. — I’ve never done this myself, but some aspiring writers find other aspiring writers and get together regularly to critique each other’s work. Writers’ conferences, which I have participated in, also are a wonderful way to learn and receive valuable feedback. — Get inspired! Subscribe, or borrow from the library, a magazine for writers. Most come out monthly, and my favorite is The Writer. You’ll receive advice on writing and getting published. You’ll also learn about specific markets for your work. Most important, you’ll get a mental boost to keep on keeping on. — When you’re ready to pitch an article to a publisher, purchase or borrow from the library a book like “Writer’s Market.” It lists book and magazine publishers and how to contact them. More important, though, it tells you what sorts of articles or stories they’re looking for and how they want them presented. It also contains helpful how-to articles. — Be prepared to handle rejection. It’s part of the writing biz. You may get lots of letters turning your submission down before some intelligent editor who recognizes true talent buys your first article. Take note of any rejection letters that are personalized. Once in a while, a thoughtful editer will offer suggestions for making your article more attractive to a publisher. Take note of those remarks. But the main thing is, if you really want to write, don’t be too discouraged. Keep on keeping on. I am so glad I wrote. I invested in one of the books you mentioned long ago on who to write to, etc., so I know what it is. Your advice is sequential, concise and very very helpful. It is exactly what I was longing to hear. I am very grateful. A few years ago there was a writer who bought one of my photographs, who listened to me, read my writings and was willing to help me along and give me suggestions. Then she and her husband got transferred. (I live in Leavenworth, KS where a lot of the military officers come for training at the Command and General Staff College). I really regretted letting my anxiety and fear hold me back from that wonderful opportunity. She was a lovely person. She told me the truth as you have, that you may not get published for a long time, and if you do, you may not get very much for an article. “Don’t be discouraged. Keep trying.” She also kept the journal you suggested and had it always with her. Life happened, some health things, and now I am on the verge of leaving the stifled environment I live in and finally do something. For many years friends and family have commented on my use of words and said I should become a writer. Now I will. It is time. I already have rewritten many things of mine, seeing how I could improve my use of words, so that is one step I have taken. I also just bought a very small recorder to have on me to make notes to myself and to use for interviews. Small steps I know, but at least they are steps forward. Someday in the future when I publish my second item I will send it to you. The first was a poem.